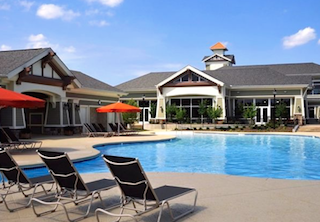 Sun City Peachtree offers an amazing collection of resort-style amenities to support a vibrant lifestyle. Spread across 1,700 acres of pine forests and rolling hills, Sun City Peachtree offers beautiful living in Griffin, Georgia. This Del Webb community was designed to support a vibrant lifestyle with an exciting line-up of resort-style activities, including golf, tennis, swimming and more. Single-family homes in a wide variety of ranch-style floor plans appeal to active adult homebuyers. 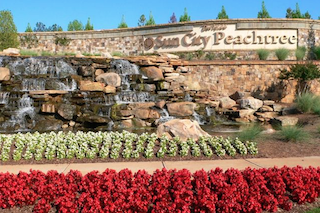 In 2007, Del Webb opened Sun City Peachtree as a retirement oasis, just 35 miles south of Atlanta. This quiet community features scenic charm and on-site recreations, while still being within close proximity of urban attractions. Closer to home, Griffin offers many retail centers, restaurants, medical facilities and other daily conveniences. Resident golfers love the Canongate Sun City Peachtree Golf Club. The 18-hole, par-72 course, designed by Gary Stephenson, provides challenging play across 6,822 yards of lush greens and towering trees. With a membership, residents also have access to the 23 Canongate golf courses found throughout the Atlanta metro area. Sun City Peachtree residents are impressed with the gated community entryway and beautiful landscaping. Beyond golf, Sun City Peachtree supports a wide range of interests. Most social and recreational amenities are centered around Club Peachtree, a 45,000 square-foot clubhouse. Here residents can enjoy hobby and game rooms, an arts and crafts studio, a library, a computer lab, a spacious ballroom and more. The state-of-the-art fitness center also makes it easy for residents to stay in shape with cardiovascular and strength-training equipment, an indoor walking track and an indoor pool. Sun City Peachtree's beautiful grounds provide an ideal setting for many recreations as well. Residents can gather on the outdoor patio or cool off at the resort-style swimming pool. Sports courts include nine Har-Tru tennis courts, eight bocce ball courts, three pickleball courts and a basketball court. The grounds also feature botanical gardens and scenic trails for walking or biking. Upon completion, Sun City Peachtree is expected to include 3,387 single-family homes, specifically designed for active adults aged 55 or better. Current homebuyers can choose from available resale and new construction homes in sizes ranging from around 1,100 to over 2,700 square feet. Most homes are single-story, although larger designs may include basement and loft options. Homes with second-story lofts still include first-floor master bedroom suites. Single-family homes are offered across three home series: the Azalea Collection, Dogwood Collection and Magnolia Collection. Each home has a minimum of two bedrooms, two full bathrooms and a two-car garage. Larger homes may have up to four bedrooms, three bathrooms and three-car garages, as well as separate dens. Impressive amenities, diverse homes and a prime location come together to make Sun City Peachtree an ideal option for active adults in the Atlanta area.